Russia called Saturday for dialogue to resolve a dispute between Qatar and its Gulf neighbours, as Riyadh and its allies welcomed US President Donald Trump’s demand that Doha stop funding extremist groups. Rights group Amnesty International warned of “heartbreak and fear” suffered by ordinary people caught in the diplomatic crossfire. Moscow’s appeal came after US Secretary of State Rex Tillerson encouraged Saudi Arabia and its allies to ease their land and sea “blockade” of gas-rich Qatar. On Monday, Saudi Arabia, Bahrain, Egypt, the United Arab Emirates, Yemen and the Maldives severed ties with Qatar, accusing it of backing terrorism, and imposed punitive measures. Niger on Saturday recalled its ambassador to Doha “for consultations”, the foreign minister in Niamey tweeted. Qatar called the accusations baseless and dispatched Foreign Minister Sheikh Mohammed bin Abdulrahman Al-Thani on a diplomatic offensive to enlist support from abroad. On Saturday, he was in Moscow to see Russian Foreign Minister Sergei Lavrov, after visiting Germany and Brussels. “We cannot be happy in a situation when the relations between our partners are worsening,” Lavrov said. Russia is “ready to try to do everything in its power” to help resolve the crisis, he said. Sheikh Mohammed said his aim was to inform Russia about “the illegal measures” taken against Qatar. Despite Kuwaiti efforts to mediate, the crisis appeared to escalate on Friday as Saudi Arabia released a joint statement listing 59 Qatari entities and individuals, including members of the royal family, as involved in “terrorist” activities. And Trump told a White House news conference Qatar “has historically been a funder of terrorism at a very high level” and said “they have to end that funding”. 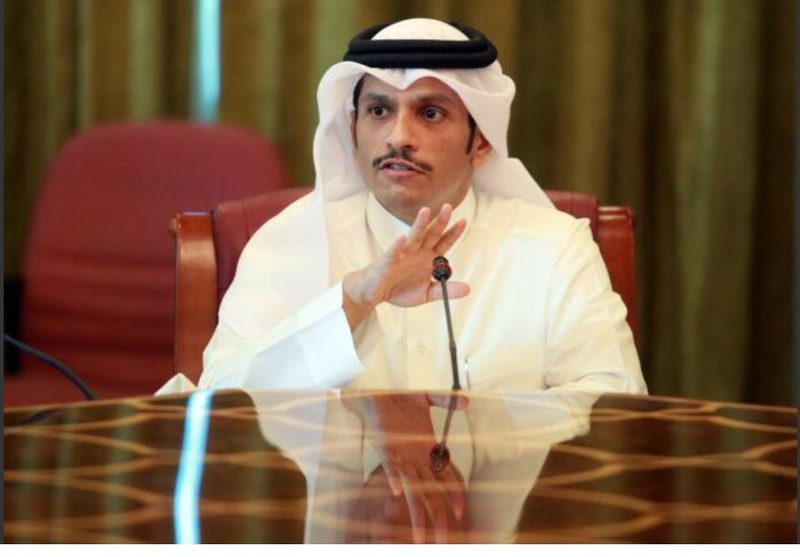 Qatar’s detractors seized on his remarks as vindication of their stance. The UAE welcomed “President Trump’s leadership in challenging Qatar’s troubling support for extremism”. Saudi Arabia called for an immediate change of policy by Qatar. “Fighting terrorism and extremism is no longer a choice, rather… a commitment requiring decisive and swift action to cut off all funding sources for terrorism regardless of its financier,” the Saudi Press Agency cited an official source as saying. Bahrain also said Qatar needed to “correct its policies”. Saudi Arabia and its allies accuse Qatar of sponsoring extremist groups, some allegedly linked to Riyadh’s arch-foe Iran, fomenting regional trouble. They also resent Doha’s ties to the Muslim Brotherhood movement and its sponsorship of the pan-Arab satellite television network Al-Jazeera, which has given opposition figures a platform. Qatar has denounced the allegations and received backing from its close ally Turkey, whose parliament approved the deployment of troops to defend the emirate. Turkish President Recep Tayyip Erdogan on Friday said he has never known Qatar to support “terror” organisations and vowed to “continue to give all kinds of support” to Doha. On Saturday, Turkish media said Erdogan met Bahrain’s foreign minister and said he hoped the dispute would be resolved by the end of the Muslim fasting month of Ramadan on around June 25. Turkey’s troop deployment was “not targeting any Gulf country”, Turkish Foreign Minister Mevlut Cavusoglu said after meeting with his Bahraini counterpart Sheikh Khalid bin Ahmed Al-Khalifa. The purpose was “to help foster security and stability across the Gulf”, he said. Trump’s Qatar comments Friday overshadowed earlier remarks by Tillerson that the stand-off was hindering the US-led fight against the Islamic State group. But US officials insisted the message was the same — countries in the region should not allow their differences to hamper the fight against extremism. Pentagon spokesman Captain Jeff Davis said the “evolving situation is hindering our ability to plan for longer-term military operations”. 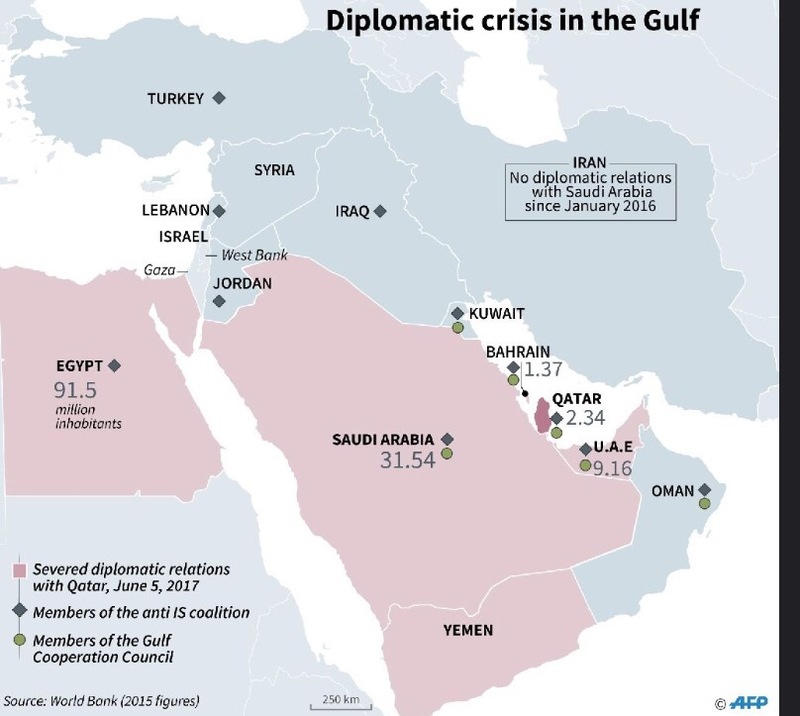 The rift between Washington’s key Western Gulf allies has escalated into the region’s worst diplomatic crisis in years. Tillerson said it was also having humanitarian consequences. Amnesty International echoed him, saying the sea and land blockade and other “drastic” measures against Qatar were taking their toll on families, workers and students. “Saudi Arabia, Bahrain and the United Arab Emirates are toying with the lives of thousands of Gulf residents as part of their dispute with Qatar, splitting up families and destroying people’s livelihoods and education,” the London-based watchdog said. It noted that Bahrain, Saudi Arabia and the UAE had warned of harsh punishment, including up to 15 years in jail, if people “dare to criticise these measures” against Qatar. The measures include banning Qatar Airways from airspace and closing Qatar’s only land border with Saudi Arabia. The Arab states have also ordered Qataris out within 14 days.